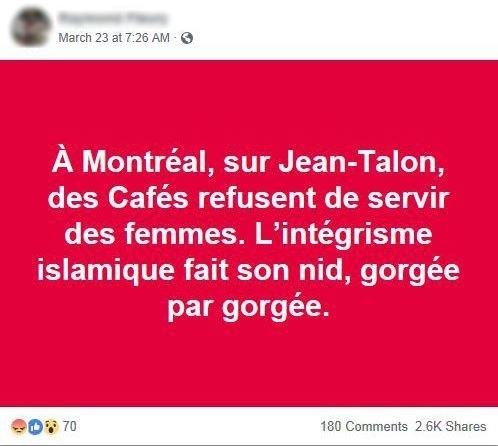 Residents of a Montreal neighbourhood with large Tunisian, Algerian and Moroccan populations reacted with shock to an online hoax claiming that women were banned from area cafes. The Facebook post regarding cafes on Jean-Talon Blvd. was shared more than 2,500 times. In subsequent comments, Café Sable d’Or was singled out, but a Radio-Canada investigation revealed the claim was false and the man who posted it doesn’t live in Montreal and had never been inside the café. A café assistant manager said women are always welcome and are usually served first. “I find this a bit stupid, we always have women in here,” he said.